3/8/2013 One great benefit of using Dedoose as your mixed methods or qualitative data analysis software is that you can collaborate in real time with other users around the world. This is powerful if you understand how to make it happen. First things first. Adding someone to your account and adding someone to your project are two different things. Adding someone to your account means you want to pay for their usage. Adding someone to your project means you want to share your data with them in some way. Don’t worry…we will explain. If you want to work with other users but not pay for them, that is ok too! You can add a user to your project via the Security Workspace. If you have not added anyone before, you will start by creating a new group. Do NOT move your own name from the Full Access group or you might lock yourself out of your data. Instead, click on the ‘Create New Group’ button to create a group, which outlines the permissions that will be granted when this particular user joins your project. Then simply select, ‘Add User’ and enter their credentials to start collaborating. By adding someone to a project you are not automatically paying for anyone. If you are added to a project you are not automatically being paid for. ONLY a project administrator, the person running the show with FULL ACCESS, can add a user to a project. If you email. Dedoose Support to be added to a project, we will ask that the project administrator adds you via the Security Workspace, or will ask that the administrator contact us directly. Groups created and users added are PROJECT specific. If you add a user to a certain group for one project, they have access to that one project only. If you want to add this new user to other projects you must add them to each project, one by one. Account Workspace = Billing When we say ‘your account’ we are talking about your contact and billing information. In other words, how we identify you, how you pay, and who you pay for. When you visit the Account Workspace in Dedoose you can change your password, update your contact and billing information, create new Dedoose user accounts which you will pay for, remove Dedoose user accounts which you no longer wish to pay for…with us so far? NOTE: If you are the administrator of a project and want to add an existing user to your billing account to pay for their service please email us at Dedoose Support with the username and email address of each user so we can assist you. One more time with gusto! When someone is on your billing account, it means you are going to pay for their service. Paying for a user does NOT mean that they are granted access to your projects. 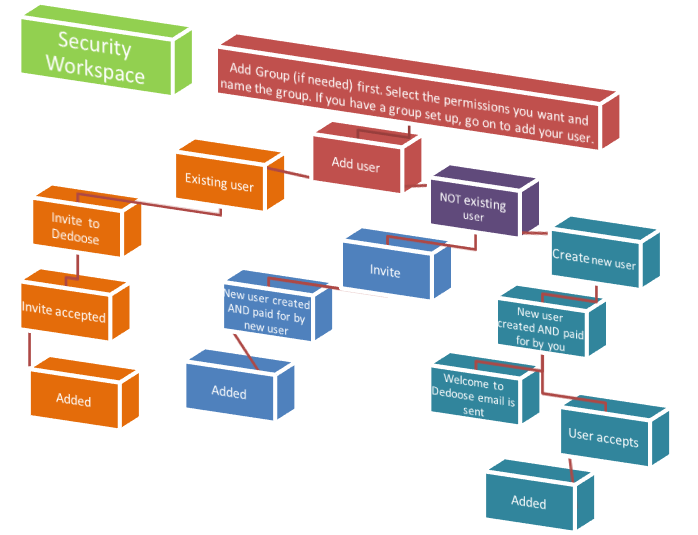 For security reasons you must add each user to projects individually, project by project, via the project specific Security Workspace.